The Urdu lyrics of "We Sinful Women" were written by Kishwar Naheed, a Pakistani feminist poet whose work is considered both controversial and inflammatory by its critics. 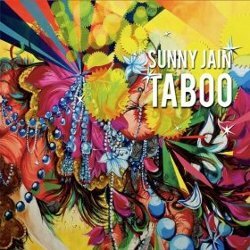 After Taboo, Indian-American drummer Sunny Jain could be just as controversial -- and hopefully, just as effective in getting his message across. Jain's compositions were inspired (at their root) by "ghazals," a 12th-century Indian poetic form; however, the lyrics come from modern-day poets and lyricists who (like Jain) feel duty-bound to speak out about sexual orientation, inequality, and violence against women in the South Asian community. Not content to skewer the usual suspects, Jain launches Taboo with the brilliant epic "Jack & Jill," which highlights prejudice against bisexuals -- not just from society in general, but from elements of the LGBT community. The piece's protagonist (represented in passionate spoken-word by Yalinidream) acknowledges that some see bisexuality as "a deviance from a party line," and wonders what her "status" is in a world of Gay and Straight: "Is it straight, or… great?!" The smile on that last word can be heard for miles. There are no smiles at the end of "A Sufi": Noted vocalist Sachal Vasandani is a boy with "a woman inside me," dreaming of having his/her "palms and feet painted with henna" and of the man who will "come and unveil me." We dance with the dream until the piece's conclusion, where the protagonist's poverty (and resulting existence as a child prostitute) shows that his dream is as far away as the moon. "Two Ladies" examines two farmer women finding each other and sharing "richness through a secretive sound." For them, coming out isn't even a dream, let alone an option. Jain's arrangements mix conventional South Asian musical structures with Western progressive jazz, with mind-blowing results. Pianist Marc Cary and guitarist Nir Felder shoot the traditional forms into the stratosphere, while Gary Wang's tremendous bass work lets Jain stick, move, and drive both the music and the messages home. Most importantly, every piece gives its subject a sense of empowerment, even if it's only for a moment. Although the liner notes say translations of some lyrics would be available on Jain's web site, none are posted at this writing. Then again, those lyrics aren't meant for people in the West; they are for those South Asians who live these issues every day, and who need to know they are not alone, and they are as beautiful as the music on Taboo is powerful.